You have a database of franchise "leads" with names and email addresses. And you can't get them to take your call or respond to all those emails you send. It does not matter where you bought, got or borrowered these "leads" from. What matters is connecting with them and getting a Franchise Sales appointment on their calendar. So here is what you do now. 1. Export your database of franchise leads to a spreadsheet, first name, last name & email address. It does not matter whether you have 50 or 5000 leads. Just do it. 2. Next, you are going to take 10-15 franchise leads a day, every day until the end of time and invite them one-by-one to connect with you on LinkedIn. 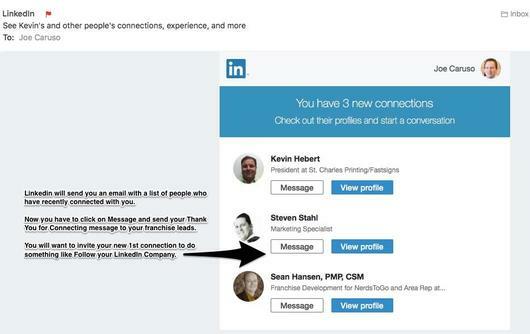 But, there is a trick in doing this without having to look up the lead on LinkedIn. This process to invite 10-15 franchise leads will take you 10 minutes or less to do. And I am going to show you how to do it right now. 3. 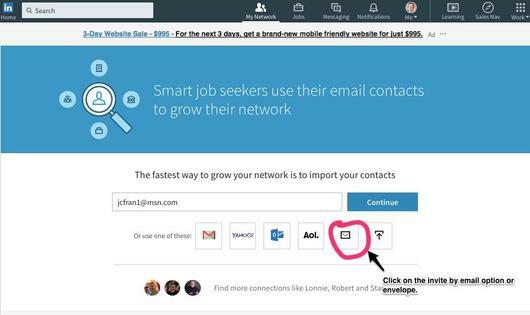 Linkedin Tip -Start on your LinkedIn homepage and click on My Network. (Click image to make bigger). A) On your My Network page click on More Options on the left side of the screen. B) Now select the invite by email option which is the envelope icon. 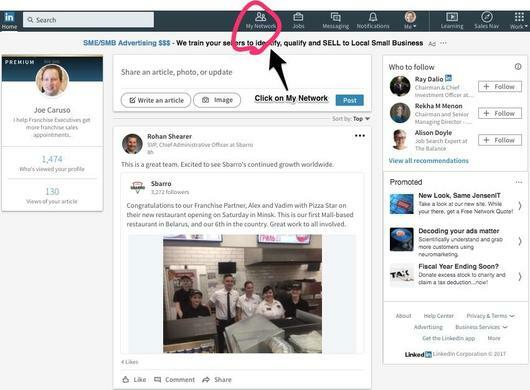 C) Here's how you directly invite your franchise leads to connect with you on LinkedIn. 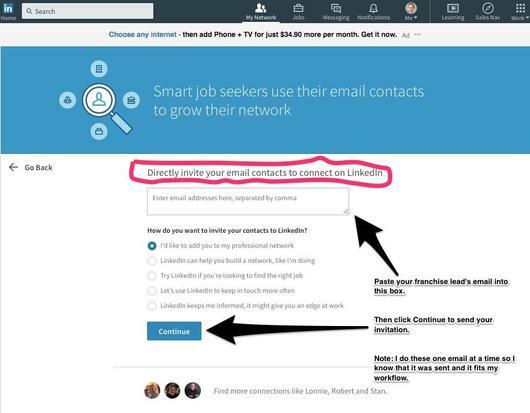 D) LinkedIn will send you a New Connections email with a list of people you have connected with. You want to start a conversation with them. And the best way to start is by thanking them for connecting. E) Make connecting with your franchise leads from all your referral sources you are paying for must become part of your sales process and workflow. 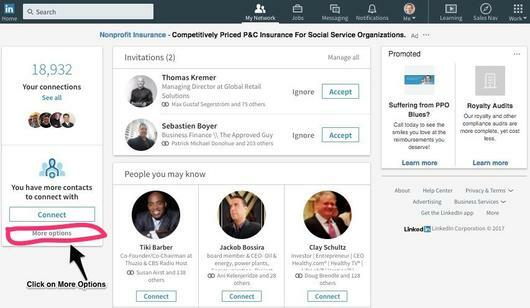 You will get more Franchise Sales appointments by doing this and having conversations with your prospects in LinkedIn. It's important to do this one-by-one so you have time to start conversations and follow the steps without overwhelming yourself. Besides great franchise sales professionals know that franchises are sold to one prospect at a time. And they always start with a Franchise Sales appointment. If you would like to know more about Prospecting for Franchise Recruits by accessing the LinkedIn database, then just sign up for our weekly newsletter.